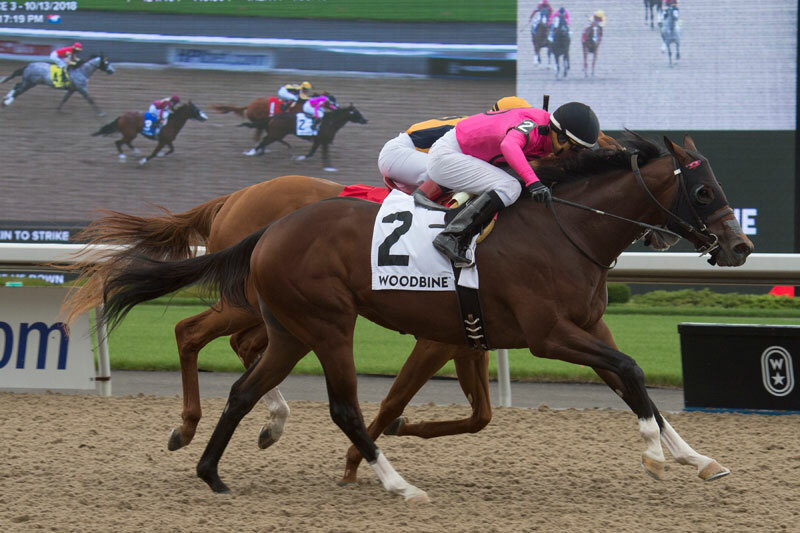 Gary Barber’s Lookin to Strike was kept in striking distance of the leader throughout most of the Grade 3, $126,750 Ontario Derby, before seizing the lead and then keeping another Mark Casse trainee at bay in the 1 1/8-mile added-money feature, Saturday at Woodbine. Ridden by Gary Boulanger, Lookin to Strike was strong down the lane and scored by a neck at 4-1 odds as he fended off a hard-closing Curlin’s Honor to take all the spoils. Mutuel favourite Mr Ritz took show honours, while pacesetting Strike Me Down faded to finish fourth. It was Sam-Son Farm’s Strike Me Down who took command early, with Lookin to Strike, Mr Ritz, Curlin’s Honor and Peppered keeping close tabs on the grey through an opening quarter-mile in :24.46 and a half-mile run in :49.39. After jockey Jose Ortiz and Strike Me Down arrived at the three-quarter mark in 1:12.11, Boulanger gave his cue to Lookin to Strike, who did just that and hit the front, 1 1/2 lengths on top at track announcer Robert Geller’s stretch call. As Strike Me Down gave way, Curlin’s Honor, under Irad Ortiz Jr., soon came calling with a spirited surge to Lookin to Strike’s inside, the duo each digging down deep and dueling to the wire in the first stake on Pattison Canadian International day at the Toronto oval. The final time for the three-year-olds was 1:49.30. The win was the fourth from nine starts and third triumph in the past four starts for Lookin to Strike, a Kentucky-bred son of Lookin At Lucky. The bay colt came into the Ontario Derby off a victory at Woodbine on September 9. Lookin to Strike paid $10, $4.90, and $3.30, while Curlin’s Honor returned $5.40 and $3.40. Mr Ritz, who won the Caesars Stakes at Indian Grand on September 5, paid $2.30 to show. The 2-1 Casse exactor paid $55.10, while a 2-1-3 triactor came back $182.30. A $1 superfecta of 2-1-3-4 returned $134.05.